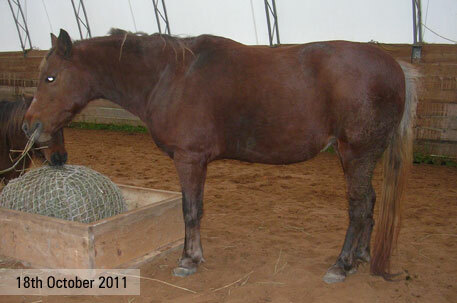 This laminitis case study features Mary, a pony we rescued in October 2011. Here is a picture and video of her on the day she arrived and as you can see she is very overweight, with large fat pads on her neck, shoulders and rump. We are not sure exactly how old she is - her previous owners thought she was about eight, but I would guess she is more likely in her teens. She has a really deformed top row of front teeth, poor girl, so it's hard to properly age her. The previous owners told me that her hooves had been regularly trimmed by a farrier - with the last trim being just one week prior. 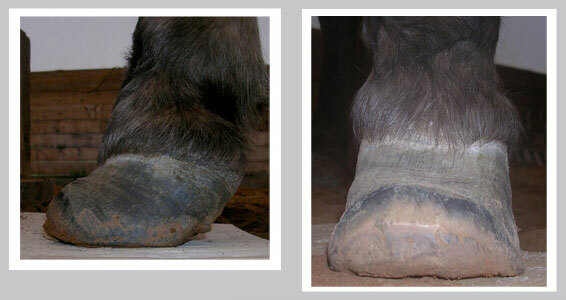 However, when we look at the photos of her hooves it is quite clear that the farrier did not understand laminitic hooves and the trim was actually making things far worse for her. The high heels were putting more pressure on a severely weakened toe and you will see in the following xrays the damage this does to the coffin bone. We immediately restricted her diet and trimmed her feet as she started to improve, however she was not progressing as well as I would have liked so we decided to get her xrayed to see exactly what is going on in her hooves. The results were pretty scary. 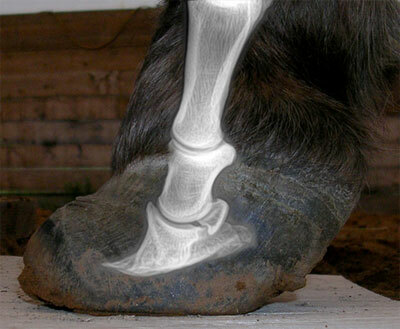 Here is the xray overlaid on the original hoof photo. 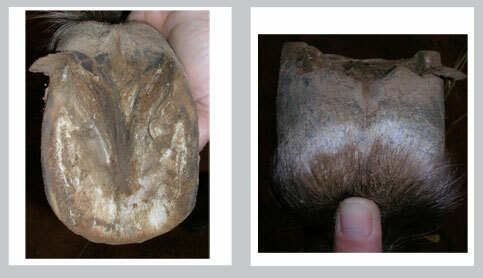 The bottom edge of the coffin bone has eroded away and an extra bone has formed a ski tip. 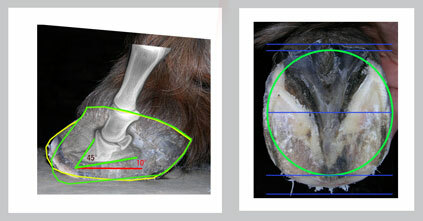 There is approx 24 degrees of rotation and the coffin bone has sunk down into the hoof capsule - known as a sinker. This sort of damage does not happen overnight. 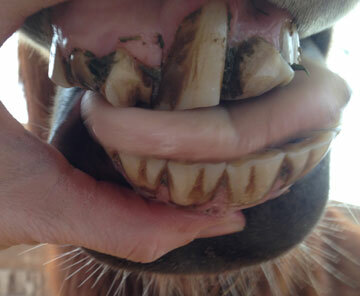 It takes many years of poor dietry management and poor hoof care to achieve this. This is the progress from October to January. As you can see, the hoof is looking much better already. The foot has come back under the leg where it is supposed to be, the heels and frog have opened up and the breakover is much closer to where it should be. 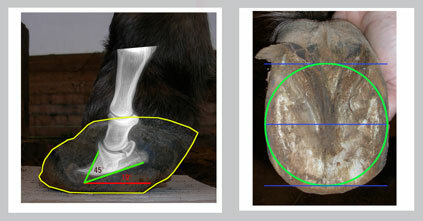 The green outline is the hoof shape we are aiming for, so we need to grow more toe height to get the coffin bone back to a more healthy position. However, with the presence of the ski tip, we may not be able to achieve a straight toe wall. In the meantime, we have put her in a pair of very small (and cute) easyboot epics with pads which are giving her protection until we grow more toe and sole depth. To date (Jan 2012) Mary is much more comfortable and is back to enjoying her life instead of being in constant pain. She has Insulin Resistance (which is very common in ponies) so we will always have to watch her diet but blood tests confirmed that she does not have Cushings which is really good news. The video below shows a comparison of her with and without the boots and it is quite clear that she likes wearing her boots! But even without them she is moving so much better than she was when she arrived - even with severe damage to her coffin bone. Ponies are just amazing! Check back later for updates on her progress. If you'd like to make a donation to help with Mary's care please click here. Please consider making a donation to help me keep this site going - donations over $10 get a free ANHC ebook. Copyright© 2008. All rights reserved. No part of this website may be reproduced without the written permission of the publisher and/or authors. The information contained within these pages is intended for educational purposes only, and not for diagnosing or medicinally prescribing in any way. Readers are cautioned to seek expert advice from a qualified health professional before pursuing any form of treatment for their animals. Opinions expressed herein are those of the authors and do not necessarily reflect those of the publisher.